I just published a nice long post regarding where and how to change your Facebook privacy settings on a desktop or laptop. Unfortunately, the methods to do this on your mobile device is much different, as are the options you can choose from. Once these are published, we will cross-link these posts so you can easily click between the two so that you do not miss a single privacy setting and are able to lock things down to the degree you are personally comfortable with. Let’s get started! Go ahead and click that “Next” button. The first thing it is going to ask you is to choose the audience for your next post – and all of those you post after that. Most of us have this set to “Friends.” Very few people want everything they share to be posted publicly, so choosing this option is your safest bet. If you do want or need to share something publicly, you can do so as you make that particular post by simply changing the audience. Obviously, I blocked out my actual phone number and email address. But you can still see from the above screenshot that I have these things set to show to all of my friends. I have my birthday, hometown and relationship status set to public and my current city is set to friends only. This is MY comfort level and may not match yours. This is where you have the control. Decide which things you want to show to the public (if any), which your friends can see and which things you want only you to be able to view. Simply tap that down arrow to the right of each item and choose your preferred setting. The next screen deals with app privacy. 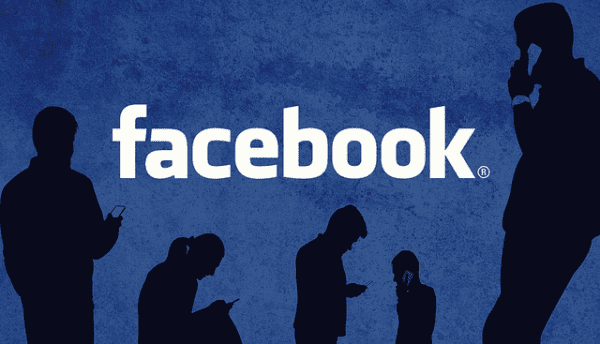 We’ve all logged into apps or companies/websites using our Facebook profile. On this screen, you can decide who on FB (if anyone) can see the apps and sites you use and completely remove/revoke any of them you do not want. 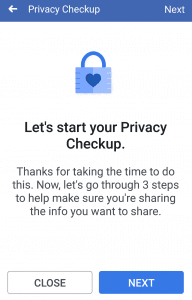 The next screen shows that your mini privacy checkup is complete. However, we are not finished just yet! There are plenty more things you can do to lock down your profile. First, let’s check the settings on your profile and cover photos. Head to your profile. In order to allow only your friends to see your profile photo, tap on your current profile photo to open it. 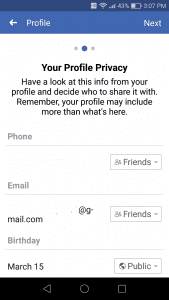 Once you have it open, change the privacy/share setting to “Friends Only.” This way, your profile photo will NOT show to anyone who you are not friends with. Additionally, you could choose to use a generic photo… one that is not of your face, such as flowers, feet in sand on vacation, a sunset or anything you choose. If you truly do not want anyone at all to be able to see your face, choose a generic profile photo such as flowers or an animal or something. With cover photos, sadly, whatever the current cover photo is will ALWAYS be public. 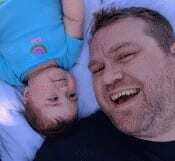 Again, you can use a generic one, such as a nature shot, a cartoon or a favorite quote. First, open up that top option called “Privacy Settings.” We have already dealt with those first couple of options in the beginning. Scroll down to the second section, which is labeled “Your Activity.” You already have decided who can see your future posts. The second choice allows you to make every post you have ever created on your Facebook available to Friends only. This is useful if you’ve made several public posts in the past and now wish them to NOT be available for public consumption. Instead of having to scroll through your entire Facebook feed history, just tap that option and set it to Friends Only. The app will automagically change every post you’ve ever made to only show to people you are friends with. The next option on the Activity list helps you decide who can see the people, Pages and lists you may follow. Personally, I have mine set to “Only Me.” While much of my life is public, I do not feel that everyone I am friends with needs to know which Pages I am a fan of. Choose whatever option makes you happy here. Last in this section is “Who can see your stories?” If you are not familiar with stories, they are slightly different than making a regular post on your Facebook page. A Story is meant to be used for photos instead of written words. Using this adds new filters and effects to the camera and requires you to choose to post to Stories rather than having it show on your timeline as usual. While this works better with your phone or tablet, it can be used on a laptop or desktop. Keep in mind that a Story disappears after 24 hours. However, as with other types of posts you make, you can choose who can see your Stories. You can allow all friends, a group of friends or even just one person to view them until they disappear the next day. Back to that Privacy Settings page shown in the last screenshot, the next section deals with people trying to locate and get ahold of you via Facebook. The first choice to make is who can send you friend requests. You can decide whether anyone in the world who comes across your profile can send you a friend request (keeping in mind you obviously do not have to accept it!) or just people who are friends with someone you are already friends with. The next thing to do is to choose who can see your Friends List. Many people do not like for others to see who they are friends with, while some of us don’t really mind. If you do not want anyone to see your friends list other than yourself, choose that “Just Me” option. Once you do this, no one can see your complete friends list. Keep in mind that people who look up your profile will be able to see people who you have in common as friends already, though. They will not be able to see anyone else you are friends with. The next two decisions you are going to make from that Privacy Settings screen is who can look you up on Facebook using your phone number and email address. This is pretty self-explanatory: if you do not want anyone to be able to do this, set it to only yourself. If you don’t mind your real-life friends being able to find you using your email address or number to find and friend request you, set it to everyone. The last thing to deal with in this area is that pesky detail about search engines called “Do you want search engines (Google, etc) outside of Facebook to link to your profile?” I have mine set to heck no! This is a fairly important setting. Even though I am a pretty public person, I do not want Google or Bing (or anyone else) linking to my FB profile on search results. This means that if someone were to decide to Google me, my FB profile does not show up in the results. If you choose to not allow this, simply change the answer to “NO” – it is set to allow it by default. Now that we have gotten through this section, tap the arrow at the top-left of the screen, and let’s move on! This section helps us deal with who is allowed to interact with what we post and who can see things on our page. The first two options ask you basics: do you want your friends to be allowed to write posts on your timeline or just you? Also, who do you want to see the posts others make on your timeline? Make those two choices and then let’s focus a bit more on tagging. If and when you allow posts and photos others tag you in to show up on your profile, who do you want to be able to see them? As usual, you can choose anything from just yourself to everyone. This next section is the one that is most important to me personally. It deals with whether or not the things people tag you in will show up on your timeline. This is the bane of my existence! I definitely do not want any photos others try to post of me to show up on my timeline without my permission, and sometimes I don’t want posts a friend or family member makes and tags me in randomly to show up. This section lets me have the control to say yes or no to these things. If you want to decide on a case-by-case basis (like me) which photos and posts you are tagged in show up on your timeline, turn ON the option for BOTH of the things listed here. On Facebook, followers are different than friends. Your friends can see everything you post to “Friends Only.” Followers can see whatever profile information you have set to “Everyone” or “Public” and can read all posts you make publicly. However, you can use this next option to not allow followers if you choose: just tap on “Public Posts” and choose whether to allow the general population to follow your public posts, or just your friends. Also, decide here who can see who your followers are, who can comment on posts that you make that are public and who can like or comment on your public profile information. Lastly, you can turn on a nifty little feature called “Comment Ranking.” When comment ranking is turned on, you will see what Facebook deems to be the most relevant comments first, instead of seeing them in the usual chronological order. 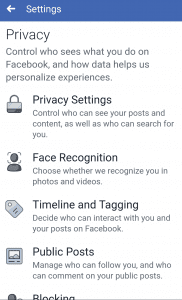 The last Facebook privacy setting we are going to take a look at is the Blocking function. If someone has been harassing you, annoying you or just somehow needs to be kept permanently away from your Facebook profile, simply click the giant plus sign and add the person’s name or email address to the block list. Once you have blocked someone and you choose for some reason to later unblock them… Facebook will not allow to you reset that block for three days. Think carefully before unblocking someone just to “check up” on them if you think you’ll want to block them again immediately, because you will not be able to. What other questions do you have regarding your privacy and protection on Facebook? Please let me know and I will do my best to get you the answers you need to keep you feeling safe online.